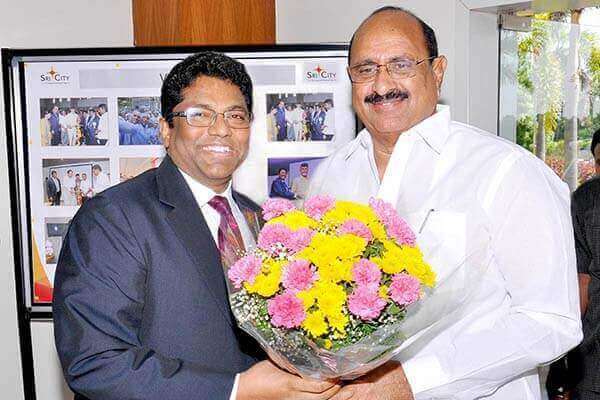 Sri City, October 7, 2016:- Dr. Kamineni Srinivas, Minister of Health and Medical Education, Government of Andhra Pradesh visited Sri City on Friday. Mr. Ravindra Sannareddy, Co-Founder and Managing Director, Sri City extended a warm welcome and briefed him on the world-class infrastructure and the brisk pace of development of Sri City. He went round the industrial park and witnessed the burgeoning industrial activity. Impressed with the infrastructure, industry-friendly ambiance and vastness of Sri City, Dr. Srinivas appreciated the initiatives taken by Mr. Ravi Sannareddy in developing such a large industrial park. Speaking about the industrial growth in the state, the minister said that ‘Make in India’ & ‘Ease of Business’ are the two mantras that are taking the state forward, citing Sri City as a fitting example.